It's true that flooring is first and foremost a practical consideration. When you're shopping for a new floor you're looking for something that will stand up to your lifestyle, fits within your budget and will be comfortable in your home. It's also true that shopping for flooring also includes picking colors and styles and designs. In fact, with all the choices available in today's flooring marketplace you can find a very practical floor that also adds just the right touch of design style to your home. Our flooring design experts have three style trends to consider when you're looking for your next floor. Layering of colors, fabrics and textures has been a big home design trend in recent years. Take those same ideas and apply them to your floor! Area rugs are a natural option for layering on top of any type of floor - hardwood, resilient luxury vinyl, tile, and even carpet. You can even layer a smaller area rug on top of a larger area rug with beautiful design effect. Subtle or bold, there's no denying that patterns are making a big comeback in home design. Some of our most popular carpet designs are those with patterns. You can find patterns built into the carpet as texture but also designed with different color fibers. Simple repeating swiss dots, larger geometric patterns, bold animal prints - patterns add a whole new sense of style to your carpet. Patterns are used well in other flooring types too! Hardwood floors can establish a pattern in the installation of differing width planks or simply in the way those planks are installed - perhaps horizontally in the room instead of the more traditional vertical layout. 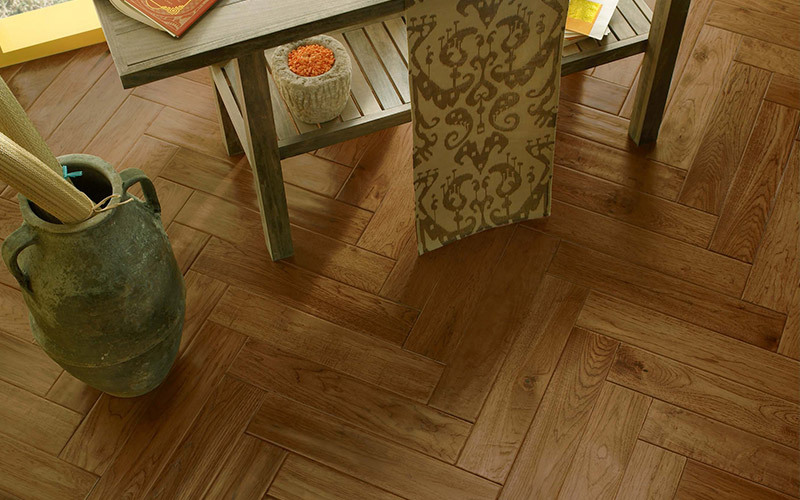 Hardwood planks laid in a herringbone pattern or diagonally creates a beautifully distinctive floor. Tile gets in on the pattern trend too with different colors and sizes. One last design style tip: make the most of your transitions! An open floor plan doesn't always mean one flooring type throughout a home. It is fairly common to have a tile entryway leading to a hardwood den and a carpeted great room. The transitions from one type of floor to the next are an often overlooked opportunity to add some style to your home. Not sure how to make these design tips work in your home? Make an appointment with our design consultants - their services are always free - we'll be happy to show you some creative ways to use your selected type of flooring. Even the most traditional floor choice can elevate the look of your home with just a few tweaks.